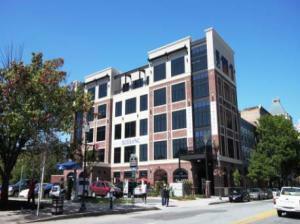 Virtual Office Greensboro, located at the newly constructed 324 South Elm Street Office building right in Down Town. Only 20 minutes driving time to the Piedmond Triad International Airport with easy reach over Benjamin Parkway. One whole floor of executive office suites are available in a modern setting. Easy access and parking around the building, an ideal location for the savvy business owner seeking a heart of the city location. Impress your clients with a real corporate look identity for just a margin of the regular price tag. All office suites are fully furnished and fully serviced, ready for your business to move in. Utilize either one of our executive offices for more permanent occupancy, or start your business with one of our virtual office plans. Our professional staff offers a shared reception area, management and administrative personal, ready to serve you and your business needs. Conference rooms and break room area are also available and can be utilized as needed. Getting your business started at our Virtual Office Greensboro location is easy. Just chose the business center which suites you best, add services as needed, like phone answering or virtual assistant services and follow the checkout process on our website. In most cases we will have your business set-up the same business day. If you would like to visit the location, make sure you give us a call at 1.866.793.7969 or inquire by submitting your information. Just press the button below this description, we will be happy to arrange a tour of the facility with one of our managers on site.